The FLSC-28 Series has been discontinued. Please see the FLSC-C3-LIQ Series as a possible alternative or contact our Flow Engineering Department. OMEGA™ high accuracy integral signal conditioners are designed for direct mounting onto OMEGA FTB-100 and 200 Series turbine meters. The input circuitry of the signal conditioners has been designed to receive and condition low level turbine meter signals while rejecting unwanted noise and spurious signals. A signal threshold control is provided which allows the user to set the input sensitivity above the ambient noise level, thereby eliminating any false signal on the output. Signal conditioners are available that can provide 4 to 20 mA, 0 to 5V, and scaled frequency pulse outputs that run on unregulated power supplies. Other units which run off 115 Vac provide both an unscaled pulse output and a 0 to 5V or 4 to 20 mA output. 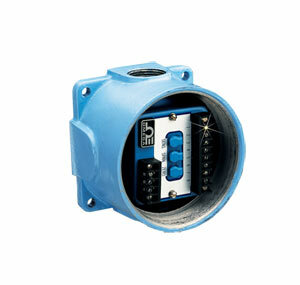 A zero and a span potentiometer allow for simple field adjustment of the analog outputs from the signal conditioners. Maximum Lead Length: 305 m (1000') of 24 gage copper wire for pulse or mA; 30 m (100') for 0 to 5V output. 참고: Signal conditioners are installed/scaled at no charge when purchased with turbine meter. When ordering the Turbine and Signal Conditioner to be scaled and installed as a system, add the cost of the turbine and the signal conditioner together for system cost. NOTE: The use of explosion-proof heads does not imply that complete assembly is either explosion-proof or intrinsically safe. It is the user’s responsibility to determine the suitability of materials for a given installation.